When it comes to great dining experiences at the Walt Disney World Resort don't forget to look beyond the Theme Parks and Disney Resort Hotels to check out the restaurants at Downtown Disney. 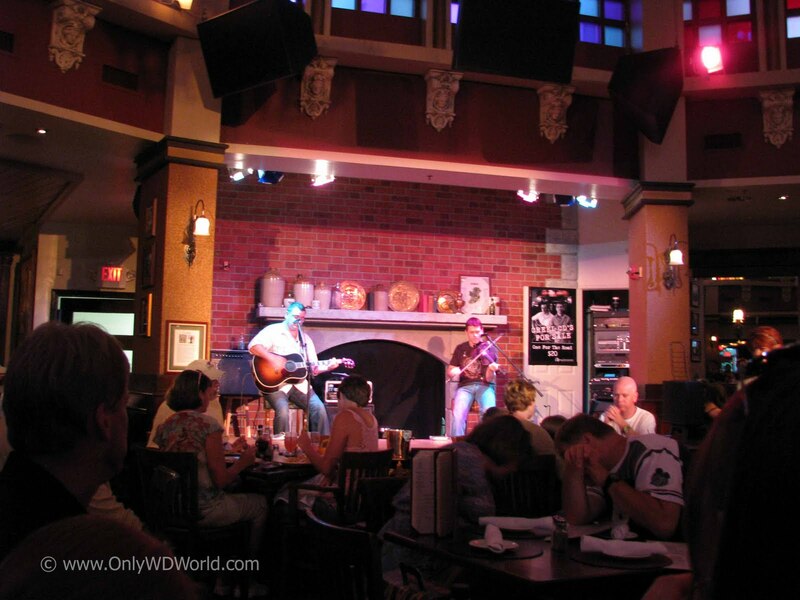 One great option is Raglan Road, an Irish Pub that is designed to make you feel you were transported to Ireland when you walk through the door. 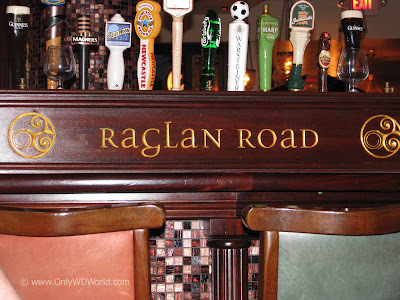 Raglan Road prides itself on bringing you the authentic Irish feeling by having Irish owners, an Irish Master Chef, Irish Entertainment, and even a large portion of the Pub itself is from Ireland. 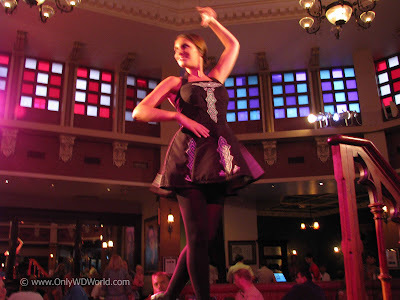 The bars are 130 years old and the stages for the Irish Dancers are 150 years old and come from Ireland also. 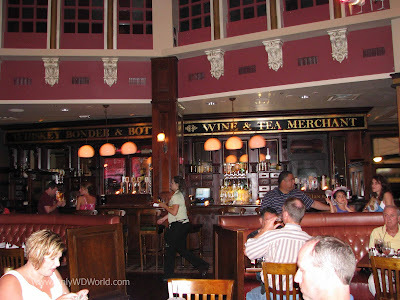 Once inside you will get the friendly feeling of the Irish Pub. 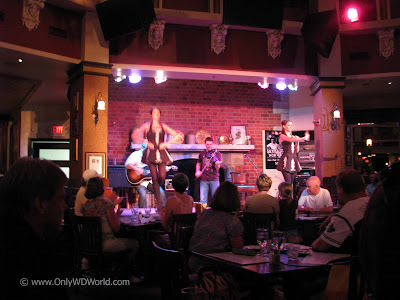 There are several different rooms that you can be seated in, including the main area that includes the dancing stages and stage for the in-house band that plays 6 nights a week. This is a family friendly place, but it is open late and is a great option for adults to visit to enjoy a pint and take in the great entertainment. 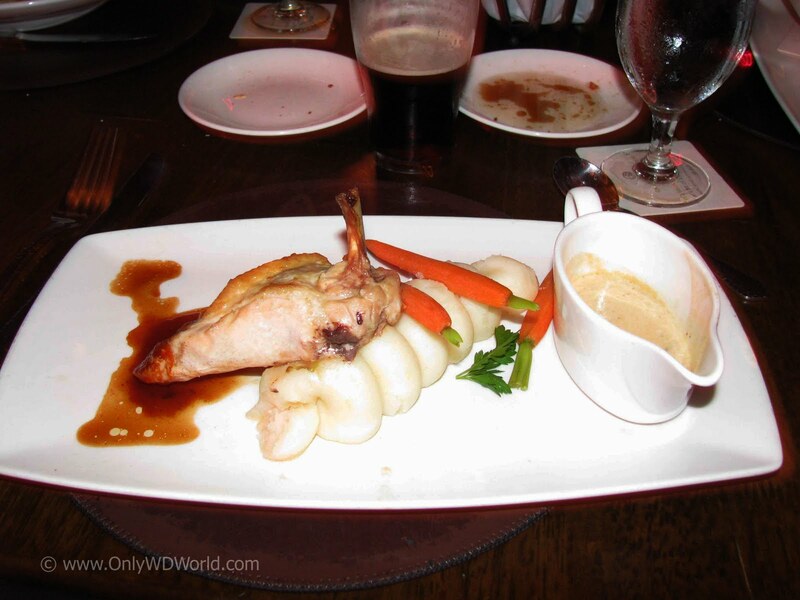 Like all great restaurants, it has to have great food, and Raglan Road is no exception. Master Chef Kevin Dundon has designed a menu that has re-invented some Irish Classics and updated many Irish flavors to create this spectacular menu. The food uses only fresh ingrediants and even the fish is flown in daily from Boston for famous Fish and Chips. The presentation of the food is just as impressive as the taste. You find yourself watching the waiters and waitresses walk by with each plate admiring the almost artistic creations. During our recent visit, our party of four tried four different entrees to check out the offerings from the Raglan Road Dinner Menu. You will find the "tongue in cheek" names for the dishes to be interesting as well. It all emphasizes the fun that you are supposed to have during your dining experience. Chieftain Chicken - Certainly not your ordinary chicken dish! This was a pan seared breast of chicken with roasted baby carrots, mashed potatoes, a port wine jus, and a mushroom spinach cream sauce. This was an incredbile dish and may have been the favorite for the table. 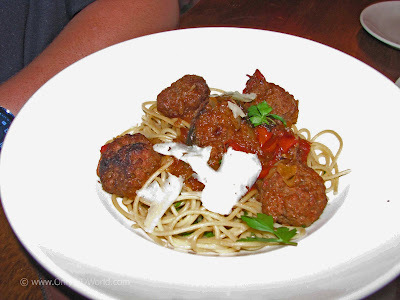 Meatballs a la liffey luv - A Irish take on "Spaghetti and Meatballs." Guinness meatballs & spaghetti in a red wine jus with tomatoes & shaved parmesan cheese. This was also a hit and would be a good choice for the less adventurous diner. Pie In The Sky - You can't have Irish fare without trying one of their signature pies. 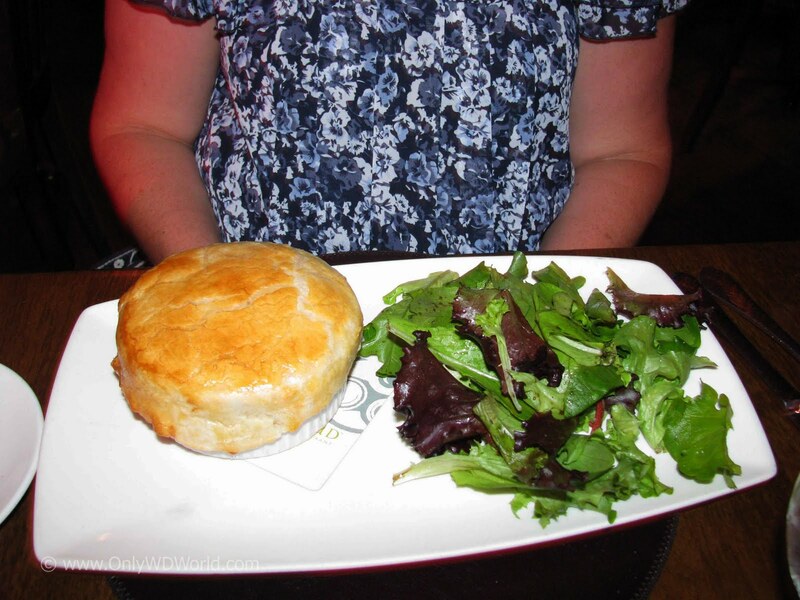 Here is a chicken & wild mushroom pie served with a rocket lettuce salad. Call it "eclectic comfort food," another great choice to try. 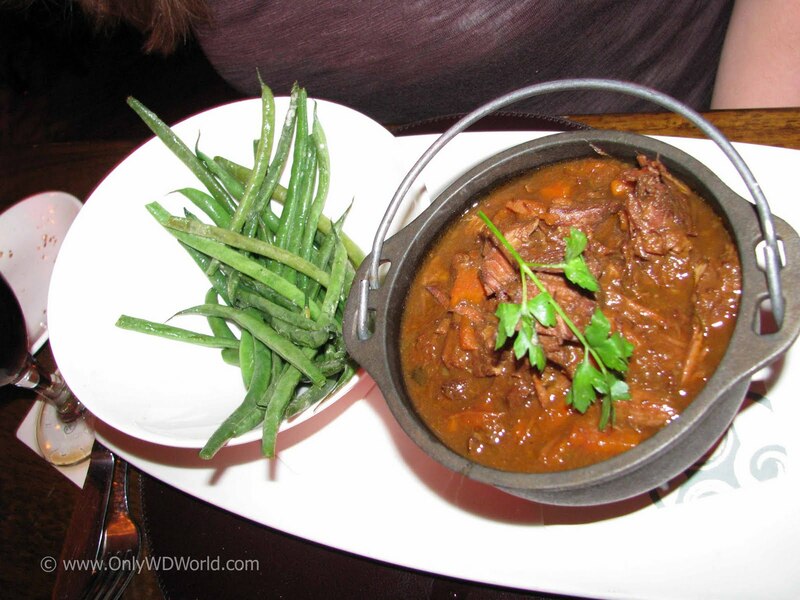 Sod the Stew - This is a beef stew infused with a hint of Guinness and served with green beans. Although this was also good, it was our least favorite only because the others got such high marks. 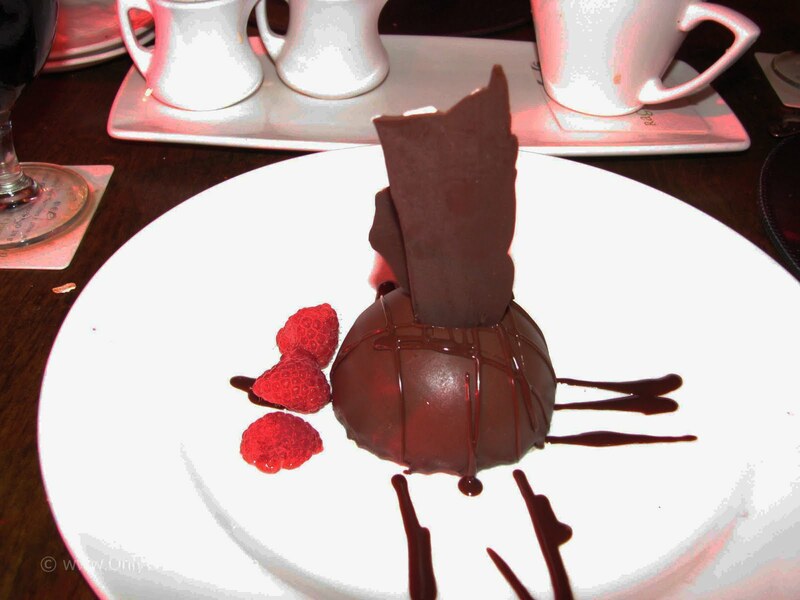 When you dine at Raglan Road you must save room for the desserts. After careful deliberation and input from our server, we choose two desserts for our table to share and we certainly not disappointed. Dunbrody Kiss - This is Chef Dundon's gift to America. If you are a chocolate lover, you will certainly enjoy this dessert as we did. Highly recommended. 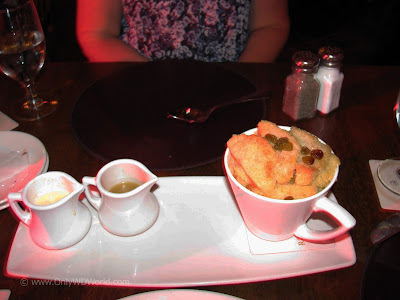 Ger's Bread & Butter Pudding - This was an amazing bread pudding! If you a fan at all of bread pudding you will absolutely love this. We could not pick a favorite amongst these two desserts, so we recommend you try both! 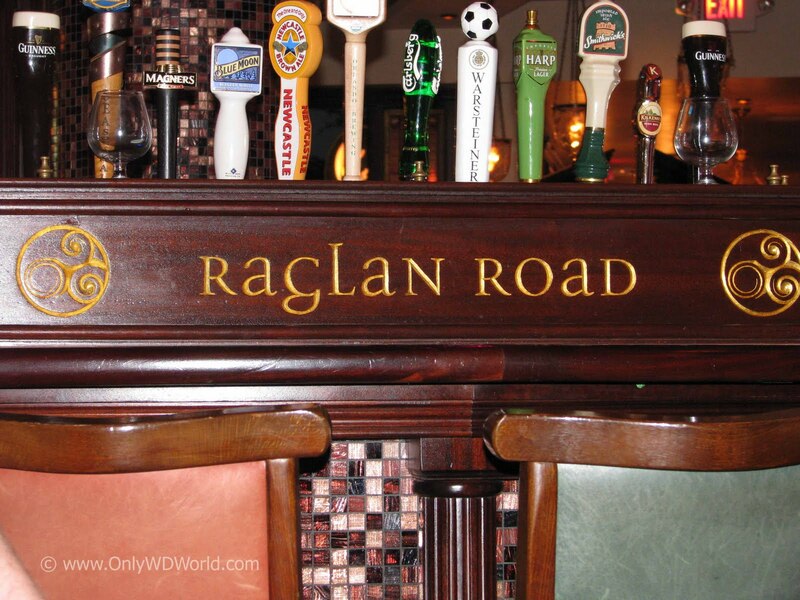 The food and wonderful Irish Pub atmosphere are only part of the Raglan Road Experience. You should definitely make sure that you visit on Monday through Saturday to see the Irish House Band - Creel and the Irish Dancers. 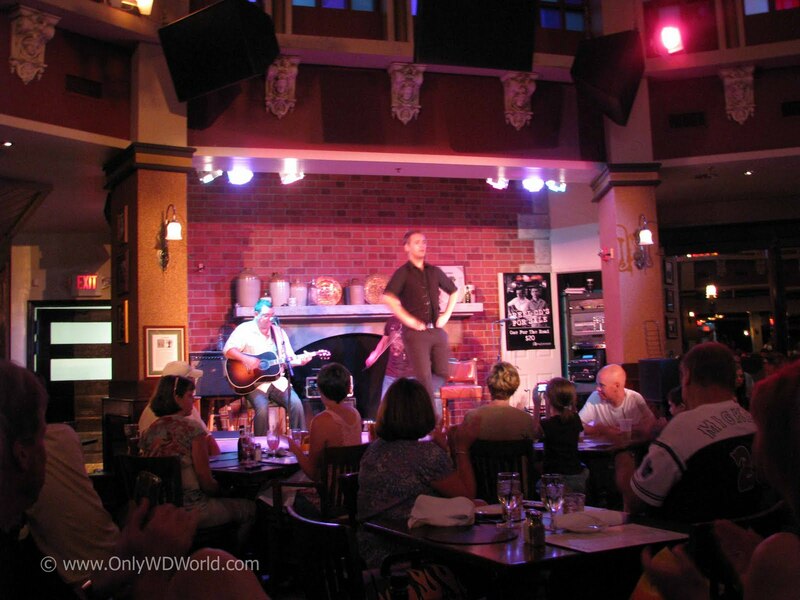 (They have different entertainment on Sunday evenings, so you won't be totally left out. 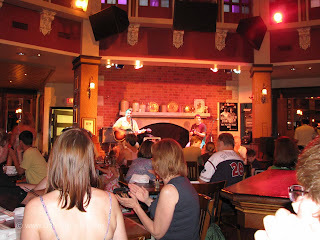 Creel - They start playing around 7:00 pm Monday through Saturday starting the evenings off with acoustic traditional irish music and then progressing into more electric charged music as they get later into the evenings. 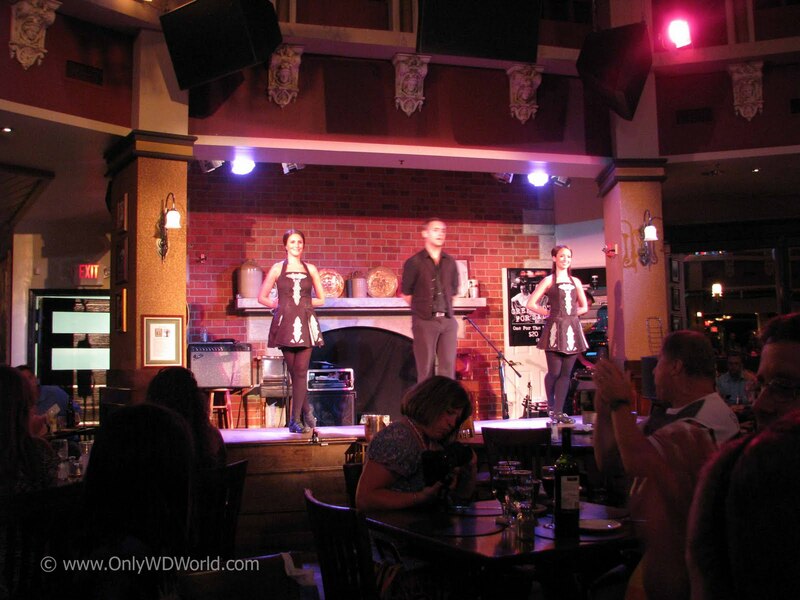 Irish Dancers - Danielle, Ivor, and Amal are the award winning Irish Dancers that will entertain you with traditional Jigs and fast paced, newly composed Irish Reels. They do an incredible job and it is definitely worth it to wait a little longer to get a table in the center of the restaurant to get a good view. 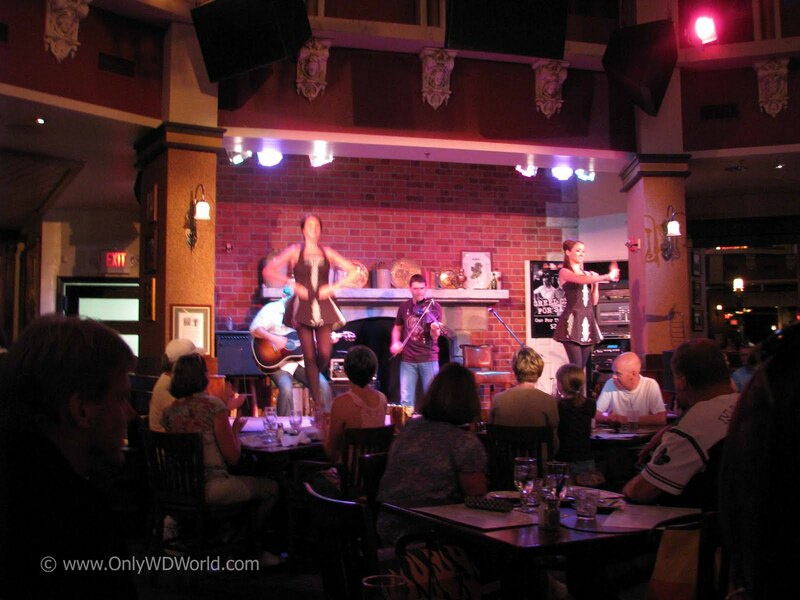 Raglan Road provides a great Disney World Dining Experience whether you are dining as a family, couple, or group of adults. The restaurant gets high marks for the authentic Irish Pub atmosphere, great food created by Master Chef Kevin Dundon, and wonderful entertainment. 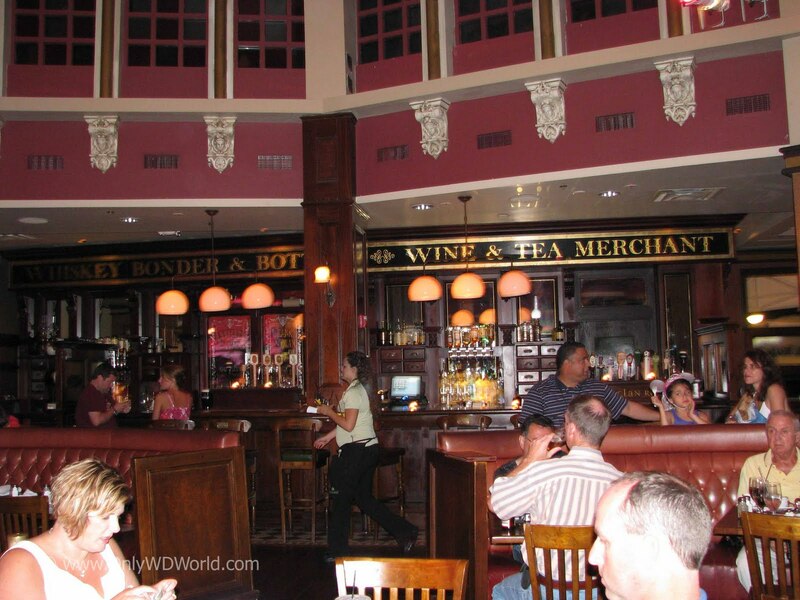 Like any great Pub it is also the place to get a pint of your favorite beverage (Black & Tan anyone?). 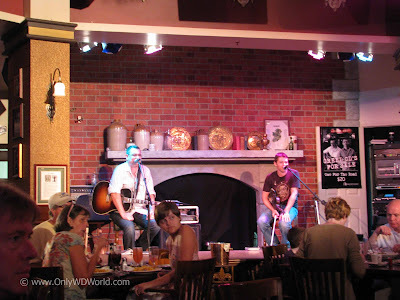 When you are making your choices for dining during your Disney World Vacation don't forget this gem found in Downtown Disney. 1 comments to "Disney World Dining: Raglan Road"